This time I’ve got a short post about another executable that I’ve found very useful. It’s CMHttpsReadiness.exe, which belongs to the Configuration Manager HTTPS Readiness Assessment Tool. 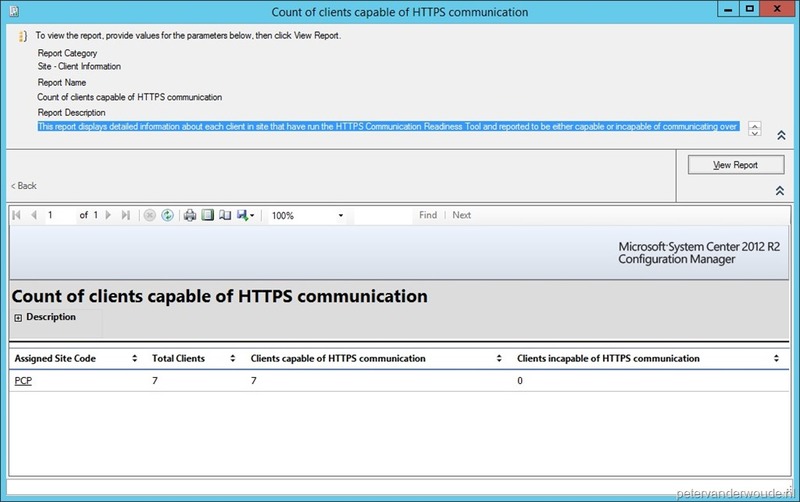 This tool can be used to check the ConfigMgr clients if they are ready for a switch to HTTPS communication. Basically, it simply checks the certificate requirements on a ConfigMgr client device. To be honest this tool even already existed in ConfigMgr 2007, but in those times the executable was named SCCMNativeModeReadiness.exe. As this tool hasn’t been mentioned a lot, I thought it would be worth a short blog post. As with almost everything ConfigMgr related, the results can be followed in a log file. The log file named CMHttpsReadiness.log will list all the activities and can be found in the ConfigMgr client log directory. Count of clients capable of HTTPS communication: This report displays detailed information about each client in site that have run the HTTPS Communication Readiness Tool and reported to be either capable or incapable of communicating over HTTPS. Clients incapable of HTTPS communication: This report displays detailed information about each client in site that has run the HTTPS Communication Readiness Tool and reported to be incapable of communicating over HTTPS. This tool can be found in the client installation directory.